Igor Gorgonzola Novara advanced to historical CEV Volleyball Champions League – Women finals! 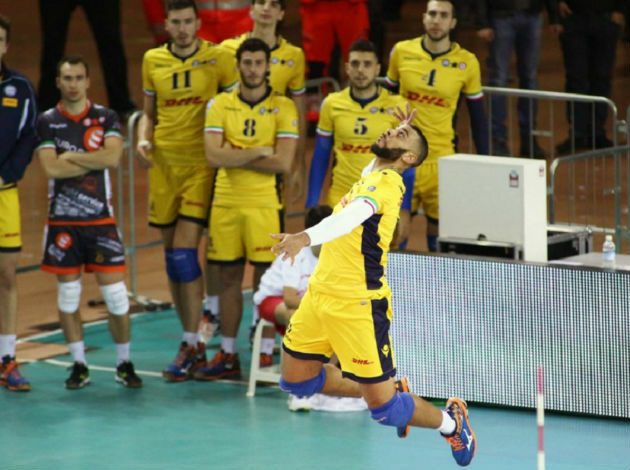 It will be an all-Italian 2019 CEV Volleyball Women’s Champions League final as Igor Gorgonzola Novara won the golden set against the reigning champions VakıfBank İstanbul in the semifinal rematch. Thus, right after playing their first-ever Champions League semifinals, Novara will play the historical, first-ever, gold medal encounter – the Super Finals in Berlin (May 18). And there, they will face compatriots Imoco Volley Conegliano. The Turkish side bounced back in a strong manner after losing the first leg in straight sets and achieved an away 3-1 win (25-23, 25-20, 15-25, 25-21) in a crowded Pala Igor Gorgonzola (3,300 spectators). But, that was an end of VakıfBank’s battle against tireless and super-fine Paola Egonu. A 21-year-old opposite hitter continued to pour in and finished the match with 39 points, closing a duel with an ace! Zhu Ting scored 26 points for the losing side but could not help VakıfBank contest for the third straight trophy in Europe’s premier club competition. 10 Comments about "CL W: Egonu’s explosion – 39 points! Novara take golden set to eliminate VakıfBank"
This does not change the fact that Vakif is still the best team in the world!! It is a pity and unfortunate that they lost the game from 14-12.. it reminded ne when they lost likewise against Cannes from 14-11 in the semi finals a few years ago..
Could Ayça make better reception than Ting on Egonus service? Are you kidding us? Too many errors and too bad play by Cansu. She couldn’t find the middle blockers. The ball didn’t reach the antenna and she was so predictable. Egonu is the best players in the world. Yaaaaaaaaay!!!!!! Go novarra!!!! Bye bye gudetti bye bye Ting!!! Bye bye what ever the setters name is. I have something that might cheer you guys up though , Vakifbank. We have Nicole Kidman on tomorrow's Oprah !!!!! Hello, I'm heart broken for you. You must have had a really bad night's sleep. Welcome to the sting of Volleyball it's like a rose , beautiful but it comes with thorns. By the way, I have something that might cheer you up for your teams loss. We have Nicole Kidman on tomorrow's Oprah !!!!!! Keep your broken heart for you! You will need it. I think, you had have some bad nights more than for ten years, maybe more?? ?...I am wondering what you have done with the rose with thorns in that time. Cried with broken heart and stung thorns, definetely! i don't think Novara understimated Vifikbank after having won the first leg 3-0, but probaly they din't played the second match with the due agonism. they really risked to lose the final after a great away win in the first match. This was not just Novara won but also volleyball won yesterday. Defeating most expensive team is always good. Money cant bring all. Accept and attack was great, but also Novara should get one more attacker. But since Black Mamba is leaving this are historic moments for Novara. Vakif should waive to Zhu and bring some fresh players (they could try to bring Tijana). She cant handle 5 sets while Italians are screaming for 5th set. Will be good match with Imoco. In 2019/2020 CEV is probably reservated for Imoco if Hill, de Kruijf, De Gennaro, Danesi, Sylla will join with Black Mamba. I wish Milena would join with de Kruijf in block. That would be bomb. Its Italian year, prpobably even in mens vollley too. Turks need some good transfers if they will want to competete in CEV. 'Novara was just lucky', have you seen the 2 matches? well said. semis are composed by two legs and, considering both as an aggregate, Novara deserved to go to Berlin. greetings from Brazil, the land of volley. i totally agree with you when you say that you never have to understimate the opponent, expecially when it has all the qualities to defeat you. anyway never mind and relax, you don't have to excuse to german fans, 'cause they will have the best show that female volley can offer: a match between to clubs from the hardest and probably most beautiful league in the world. two teams plenty of stars like: Egonu, Lowe, Wolosz, Chiricella, Hill, Danesi, De krujf, Vejlikovic, Sylla, Picinini, De Gennaro, Bartsch just to name some. by the way 2, among the players you named i really like Kim. by the way 2, Esaczabsi din't even get the semis so is a litte unlikely to them to get the final. the right spell is 'psaghetti'. 'spaghetti final' can be something really good, like 'spaghetti western'. the sport version of a duel in the style of 'il buono, il brutto il cattivo' ('the good, the bed and the ugly'). As a German fan from Berlin, I was expecting to watch the ‚Super Final‘ Vakif-Ecza, but as said fair enough, both teams underestimated their rivals especially Eczscibasi. This year was a lesson for both teams. By the way, I think it will be difficult for the Turkish clubs after now as the economy of the country is getting so bad.. Anyway, watching Egonu and the others will be also great..
God Bless You!!!! I wish you the happiest Easter!!!! As Neslihan was the last Novara bender, Vakifbank needed a tricky player like Her.